Another spectacularly unbalanced view today from the local newspaper, of yet another radical private development proposal that flies in the face of community expectation and the clear local area plan for The Spit. 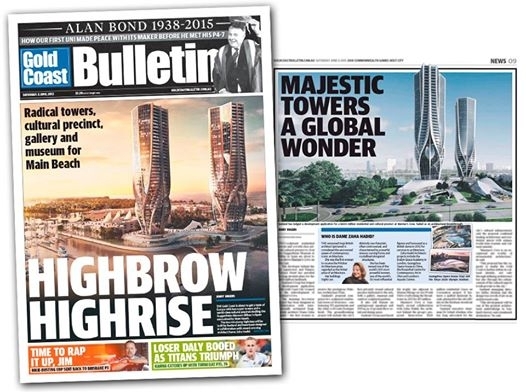 In what reads like another press release printed verbatim, the Gold Coast Bulletin is not only telling readers that the buildings are 'about to rise' - they are also hailing the thing as a 'global wonder,' an 'architectural wonder,' 'long-awaited,' 'majestic' and a 'groundbreaking project' despite the plans appearing to have no mandate, permission, cause or authority to defy community expectation, devestate our city's skyline, set a dangerous precedent and break the strict 3-storey height limit that the Spit has in place. "The southern Broadwater's foreshore areas, including areas of The Spit south of Sea World, is developed and managed to support a diverse range of marine-based tourism and recreation, commercial fishing and event activities. Low-rise accommodation, commercial, retail and marine industry activities are provided at a scale and intensity that protects local character. 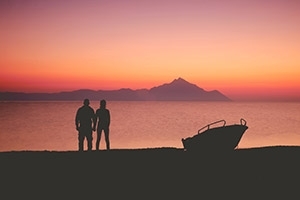 "The Spit provides a high standard of low-rise resort accommodation, tourist attractions and entertainment facilities within a recognised area of outstanding natural beauty," the report states. We see now the clear perception that he personally stands to gain should the height limits be removed. "I re­ally don't be­lieve over­all the pro­posed plan is go­ing to work," Mr Abe­dian said. "Some of the coun­cil­lors think the city plan should be based on 30 or 40 years ago when the city was built." Mr Abedian also seemed confused, trying to attach the Main Beach residential high-rise zone to the argument, suggesting it was actually part of The Spit, when in fact the two locations have a clear boundary and geographical polarity in every sense of it. He told the breakfast attendees, "In The Spit area at Main Beach, they have made it un­lim­ited height but on the other side of the road it is three storeys. Then you start think­ing, 'Give me the ra­tio­nale why three storeys?'" We can only assume that the people of New York City are forever grateful that Mr Abedian's apparent rationale wasn't applied when they determined the limits and boundaries of development around their own Central Park many years ago. Clearly their city is nowadays reaping the widespread economic, social and even environmental rewards provided by those strong boundaries and the foresight that enabled such a space to not be slowly engulfed by high rise development. In the case of both ASF and Sunland - leasing, getting gifted or being handed prime crown public land on The Spit, breaking height limits and seeking preferential treatment for proposals cloaked in private agendas, irresponsible thinking, mysterious intent and gross over-reaching factors DOES NOT FIT within community expectation for the sustainable, intelligent and respectful management of the city.